One of my favourite native plants is leatherwood, Dirca palustris. 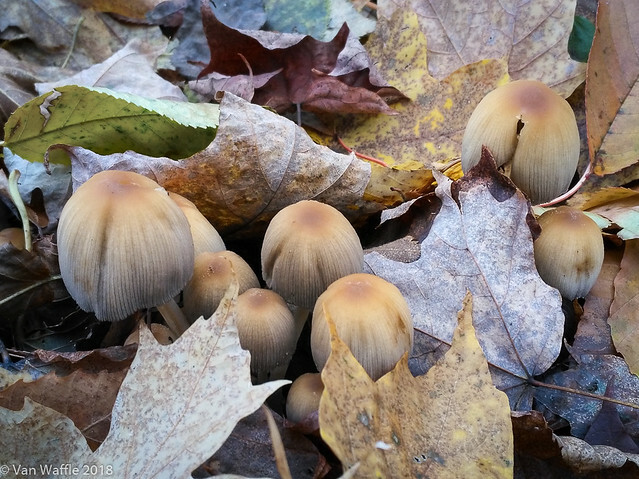 It’s a modest shrub, easily overlooked in the shadowy understory of mature woodlands. That’s why I love it in this fast, brash, showy world. At the same time when spring narcissus burgeons in gardens, this useful plant does its things with nobody noticing. Almost nobody, because here you are reading about it today. With your own brain you’re making the world a little wiser. Why useful? The name leatherwood offers a clue. Its bark is extremely flexible. In a wilderness emergency it can be used for thongs to tie and make repairs. Don’t try eating it. Leatherwood may be poisonous. Unfortunately I don’t have any photos of its unpretentious summer foliage. Here’s a drawing, vintage but accurate. 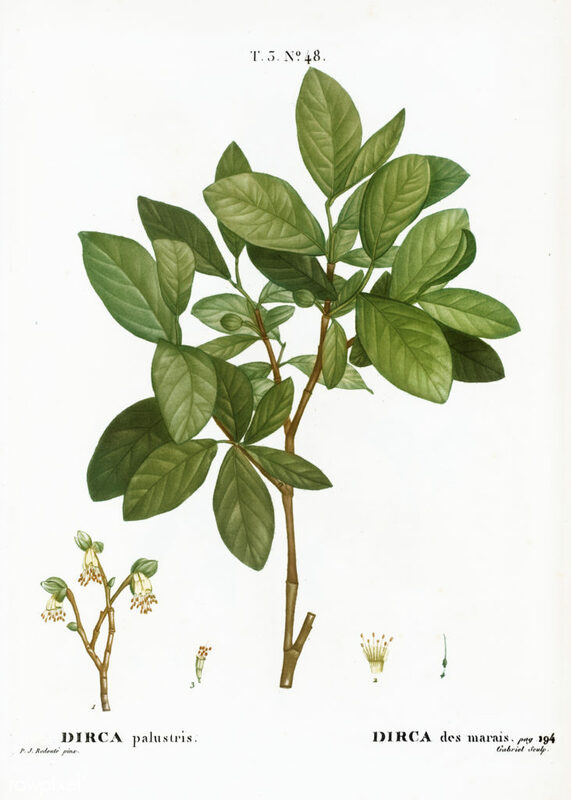 Eastern leatherwood, Dirca palustris from Traité des Arbres et Arbustes que l’on cultive en France en pleine terre (1801–1819) by Pierre-Joseph Redouté. Original from the New York Public Library. Digitally enhanced by rawpixel. This early 19th Century illustration is provided by rawpixel, promoting the work of the Belgian botanical artist, Pierre-Joseph Redouté. Note the light green, simple leaves, lacking any teeth around the margins and with a rounded point. The bark is smooth and extremely tough. The shrub seldom grows taller than a person. It likes moist shady woods especially on a slope above a stream. The genus Dirca has three or four species, all native to North America. It’s part of the fibre bark family, Thymelaeaceae, which appears around the world. Most species occur in the Southern Hemisphere, especially Africa. 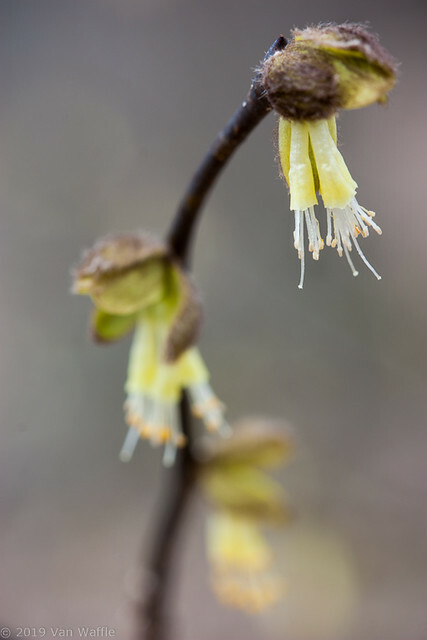 What I love most about leatherwood is it’s one of the first botanical signs of spring in Ontario deciduous woodlands. 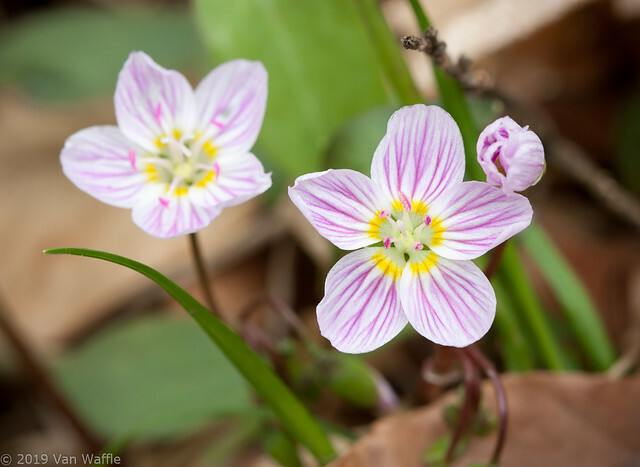 It flowers before any other trees put out their leaves, even before most woodland wildflowers bloom. They have a subtle but surprising perfume. 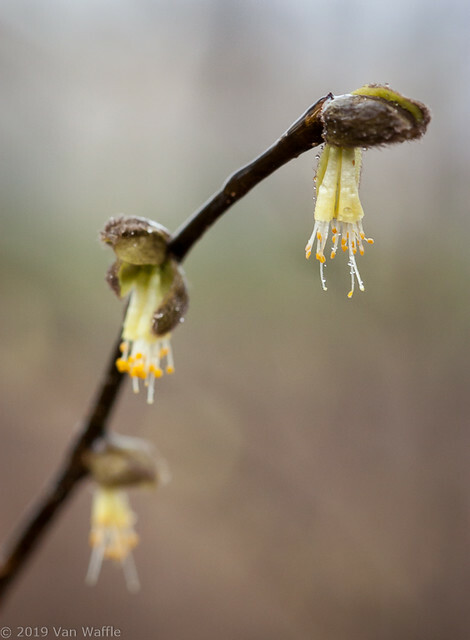 The easiest way to find leatherwood is by its spring blossoms. 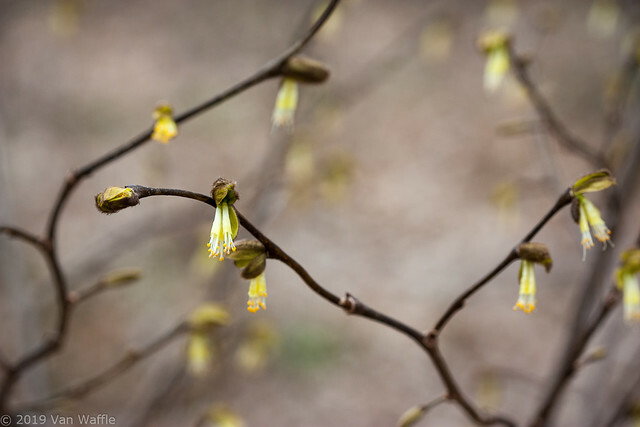 It flowers along with the first spring beauties, Clatytonia virginica. 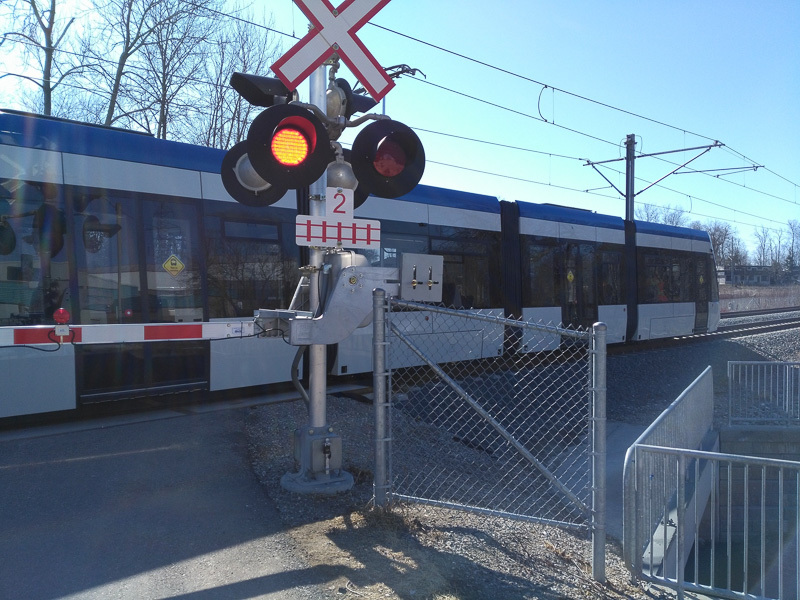 Kitchener-Waterloo’s new ION rapid transit is set to launch this spring after infamous delays. The date still has not been announced, though I see practice runs frequently. The line runs not far from my home in Waterloo. I’ll have to walk a little further to reach a station, but it’s still readily accessible. On this morning’s walk I went a different way from usual. I know where bloodroot will bloom downstream on Cedar Creek in a few weeks. 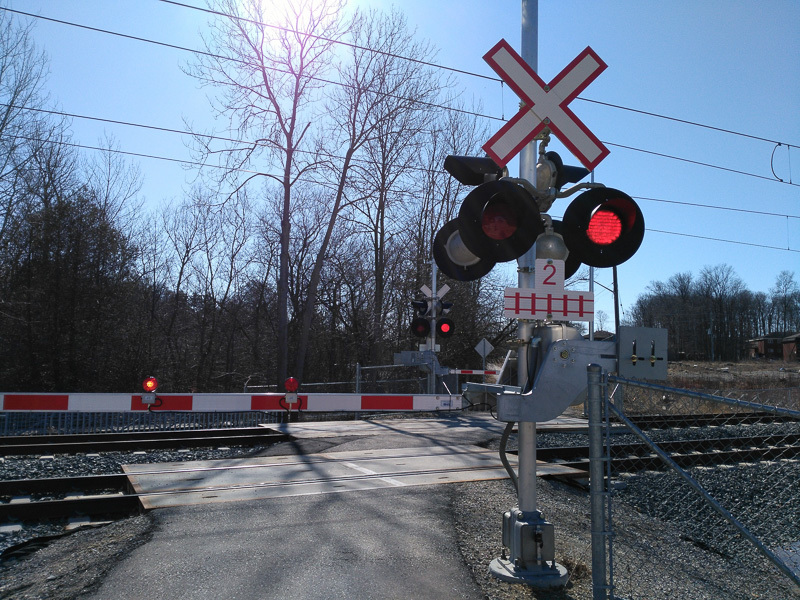 To explore that part of the park I took a different path, and passed a pedestrian crossing of the rail line. It’s more of a hike but within the time constraints of my morning routine. This part of the line follows a preexisting, renovated track. A train was working slowly back and forth along the rails. I got to see and hear the signals and safety rails in operation. I waved to the driver and her companion, but they remained focused on their activity. The young woman appeared to be receiving driving instruction. Once running, ION will give us quick access to uptown Waterloo, downtown Kitchener and other parts of the city. 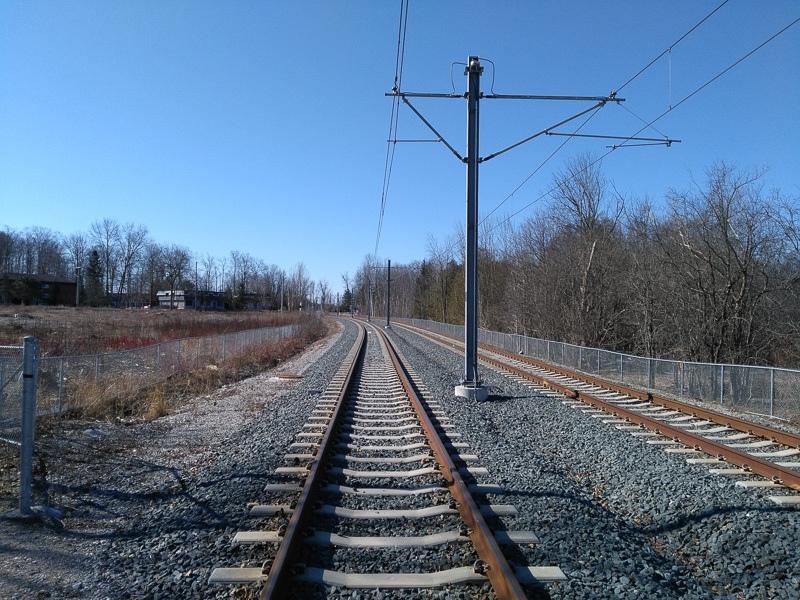 Future construction will extend the line to Cambridge. The project has been controversial because of disruptions to business and the delays in getting the new trains from Bombardier. However, we need such infrastructure to reduce traffic and dependency on fossil fuels. Continuing to follow our old ways is not sustainable. Growing pains are difficult but welcome. Today’s post goes out to Randy McDonald at A Bit More Detail who has an inspirational fascination with urban matters, and frequently posts friendly links to my blog. Cedar Creek looked splendid beyond words today. I had to stop myself right there, squatting by the stream with the camera phone. It called for me to write something, but language can’t capture anything this strange and beautiful. Here is more of the tension between photography and writing. 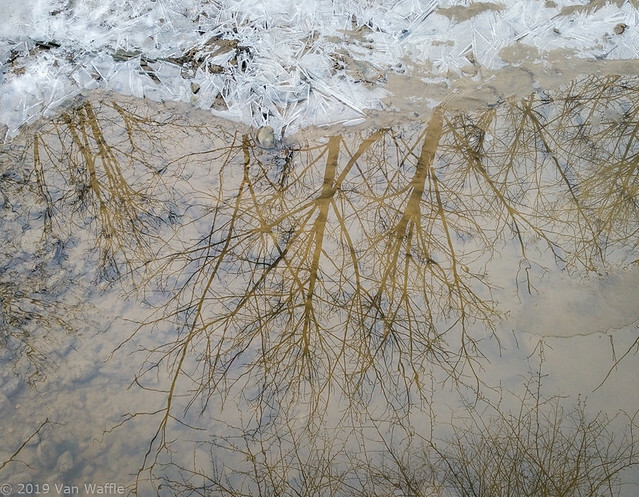 Through the winter I’ve been using photography and brief text notes to record sensual perceptions of the woods. If something remarkable comes to me, I might translate it into a narrative later in the warm comfort of my office. Memory can be a trickster. It’s superficial and evasive. 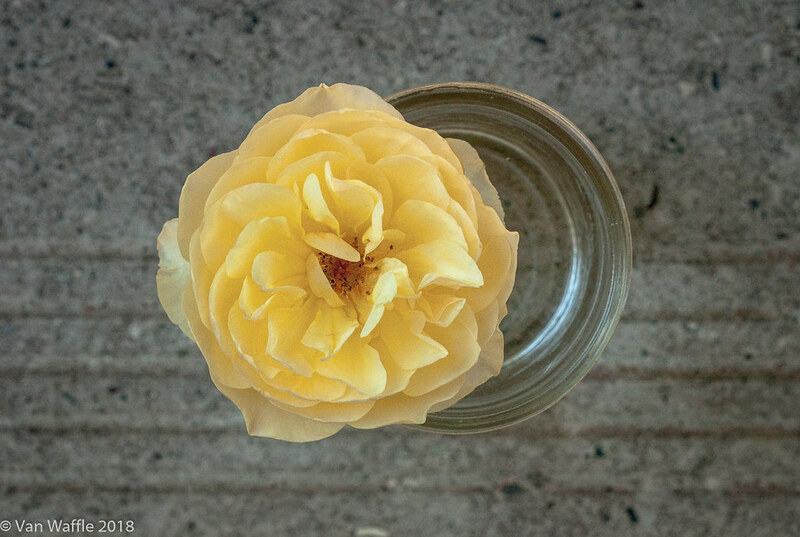 Photography, far from helping remember an experience, focuses the attention on certain details. Processing the images is a pleasure. Simple adjustments like contrast make them look their best. But during the time spent in my virtual dark room I forget other things like a pair of dogs playing uproariously in the park, their two owners standing by to watch, maybe conversing, maybe saying nothing to one another. These direct impressions, once lost, might never be accessible again to me as a writer, not in quite the same way. Last summer I spent time in the woods sitting and writing, recording things as they happened. A mink swam past, oblivious to my presence. Damselflies battled and mated over a few square metres of languid stream. Winter doesn’t provide such physical luxury to the writer. But today by the winter stream the weather wasn’t too cold or blustery. So I opened a note on the phone and tried to swipe a description of the scene before me. 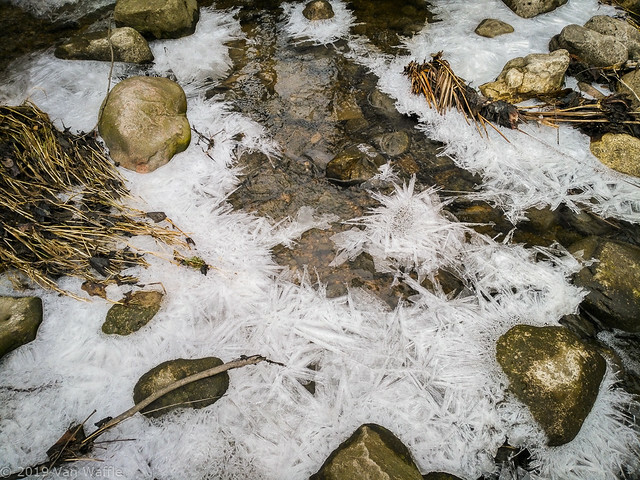 The creek runs through a crystal palace. whatever ideas it held when it froze. A memory storage of lines leading nowhere and everywhere. A dream and anxiety of ice. It’s all too easy to take a few mindless photos on a homeward rush. It’s too easy to hurry. It’s easy not to think about the small, rich gifts of life. Today I’m glad I paused and tried to put into words what can’t be put into words. My clumsy swiping said something photography couldn’t express: a personal response. There was more to what I wrote beside the stream today, but it’s harder to share. I’ll save it for a deeper context than this. The power of language is different from that of images. I remain torn between. It’s a good place to be. A muskrat lives in the creek under the bridge where I cross into the woods every day. Ondatra zibethicus are particularly reclusive, so it took me a while to wise up to its presence. Danny and I saw one three years ago a little way upstream. I didn’t see it here until last summer. I had been standing quietly on the bridge with my camera for several minutes, focusing on something else, when I heard a quiet rustle below. I peeked over the railing and there was a muskrat, perched on its hind feet eating a weed. When it saw me, it froze. As soon as I tried to manoeuvre to take a picture, it broke away, dashed clumsily across some rocks, splashed through a pool, and disappeared under a bank. Muskrat resemble beaver and are adapted for similar habitats and lifestyles. They are even known to cohabit beaver lodges and look out for their mutual predators. Both have blunt brown heads and strong tails for swimming, but muskrat are much smaller than adult beaver. A beaver’s tail is wide and flat. The beaver will use it to slap the water in alarm, but I’ve never seen one move quickly like the muskrat last summer. The muskrat’s tail is long, thin, and flattened on the sides. Above is the place where I saw the muskrat last summer (shot here during milder winter weather). 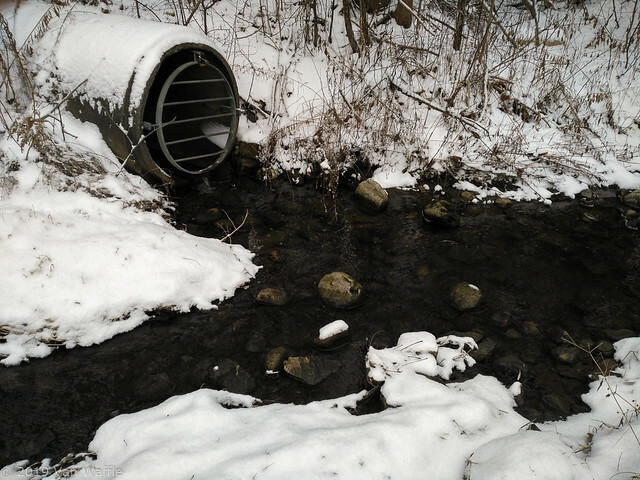 The storm drain produces a trickle of water that keeps some open ice in all but the coldest weather. Marsh muskrat build lodges of weeds, but along river habitats they burrow into the bank. Now that I know one lives here I always look out for it. The signs are few. For months I’ve seen nothing except the hollow under the bank where it vanished that day. 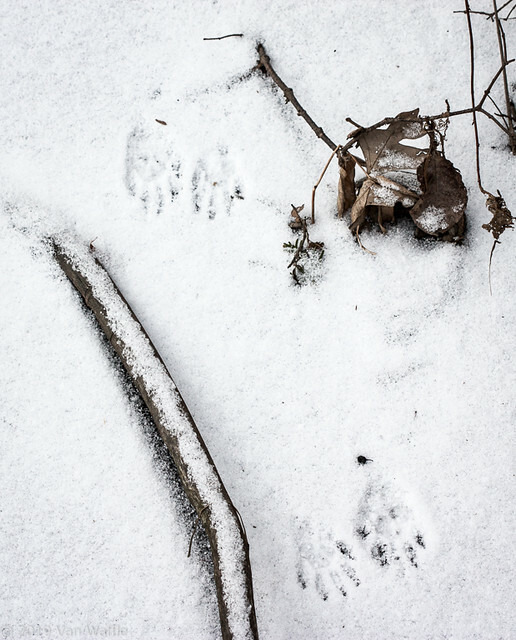 Since the creek started freezing over, the muskrat has left indelible clues. 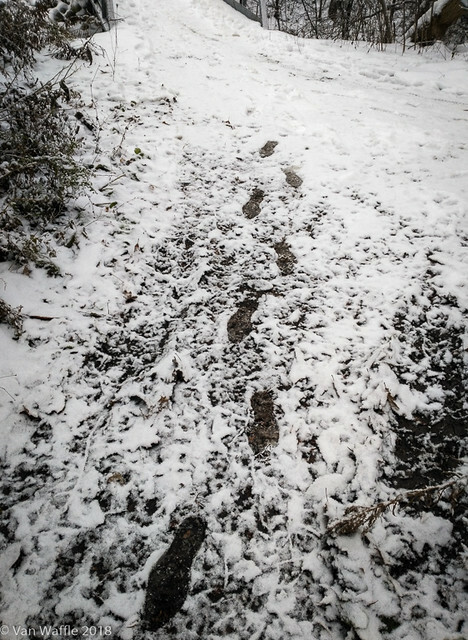 Its tracks are easy to distinguish from raccoon and squirrel, because the muskrat drags its heavy tail designed for smooth propulsion through water. The sinuous line is visible in the top photo. 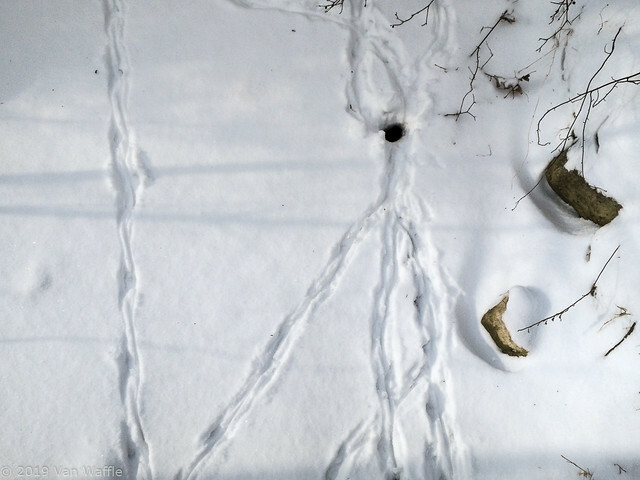 Below are the clever-pawed tracks of a raccoon left along the same part of the creek a few days ago. This morning I saw something new: the hole where the muskrat moves between the worlds of air and water. Muskrat don’t hibernate and are well equipped for winter survival. 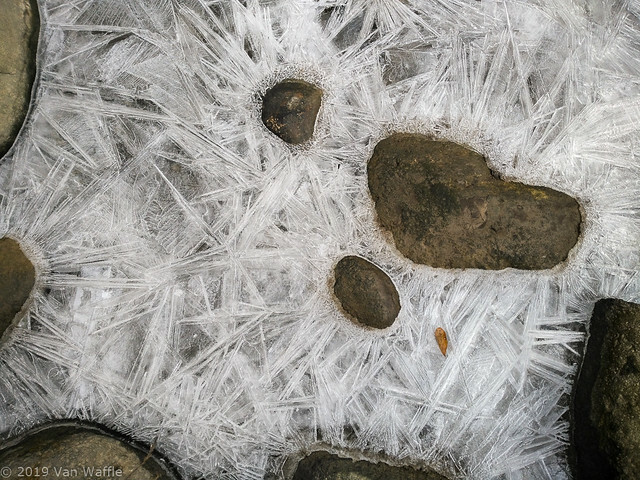 They gnaw holes in the ice with their teeth. They can remain underwater for 15 minutes without coming up for breath. Muskrat would probably prefer to forage for submerged roots and weeds. However, in this shallow stream the animal must range above the ice in search of additional food. Muskrat also cache food in their burrows. Last summer I spotted a mink wending its way upstream. A few minutes later a small animal screamed from the vicinity of the bridge. At the time I assumed it was a squirrel or rabbit. Now that I’ve seen the muskrat there, I think the victim must have been one of its family. 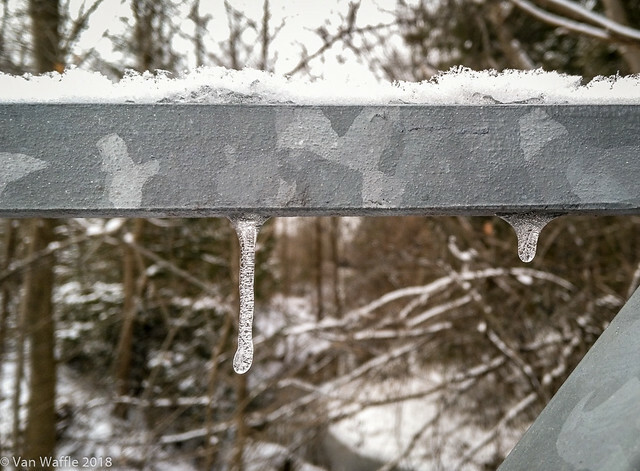 I hope both wildlife species manage to survive the winter under this bridge, a stone’s throw from my office window. The cold weather has kept me more housebound than usual for several days. This morning after a phone interview I determined to bundle up and brave the weather. A walk in the woods is the best way to unwind. 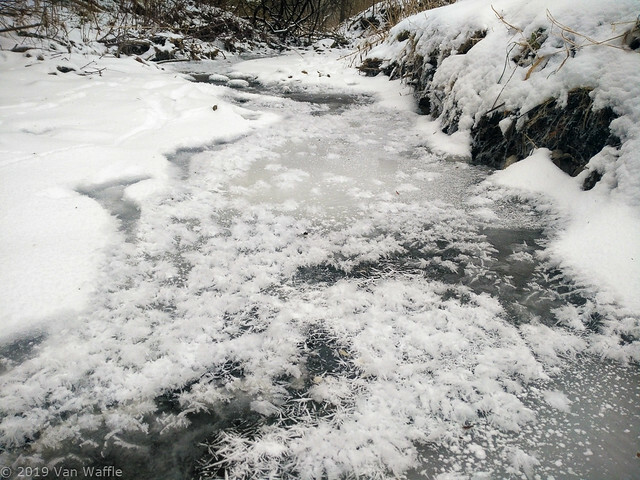 The creek welcomed me with some of the most fantastic hoarfrost I’ve ever seen. 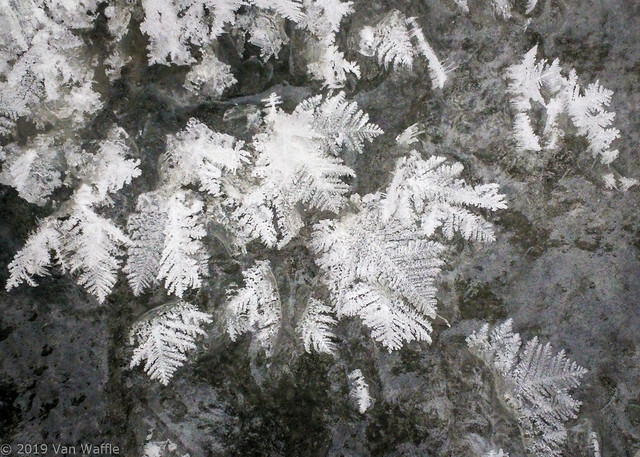 Hoar frost forms on cold, clear nights when heat escapes into the air faster than it can be replaced. 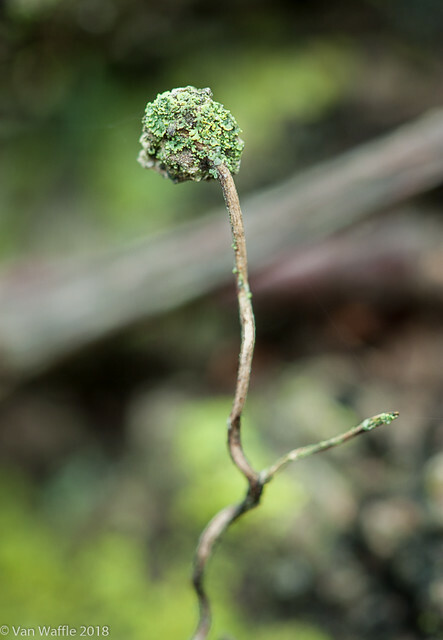 It often appears on plants or the ground. 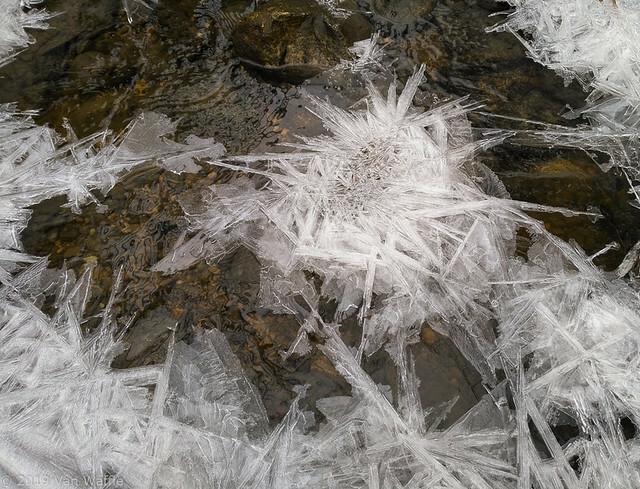 In this case it formed on slush in the creek, where there’s still some warmer water trickling from a storm drain. 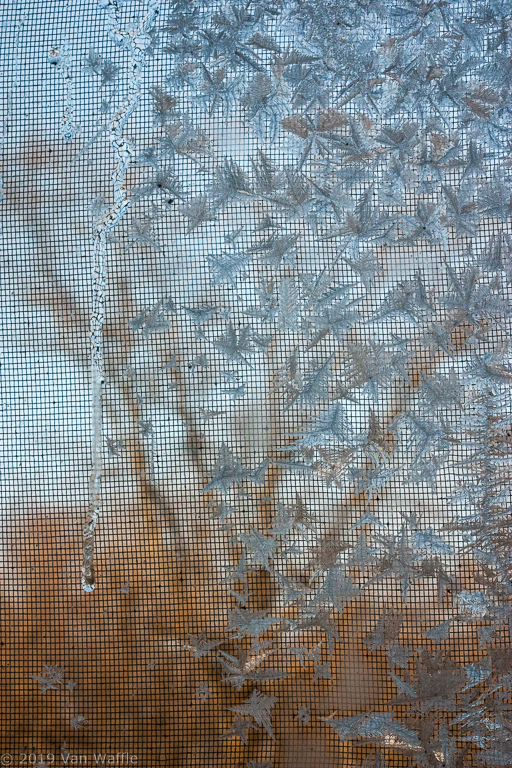 Its structure is reminiscent of fern frost, the kind that forms on old windows like the one in my office. I’ve been photographing it during the past few days of Arctic air. The window provides my primary connection with nature at these times. I’m a wuss about damp, windy winter cold. The first thing I see when glancing up from my desk a dozen times a day is a mature black cherry towering over the young maples, walnuts and oaks at this end of the woods. Neither photos nor words do justice to the friendship of one tree, especially in the falling light of a thousand afternoons. 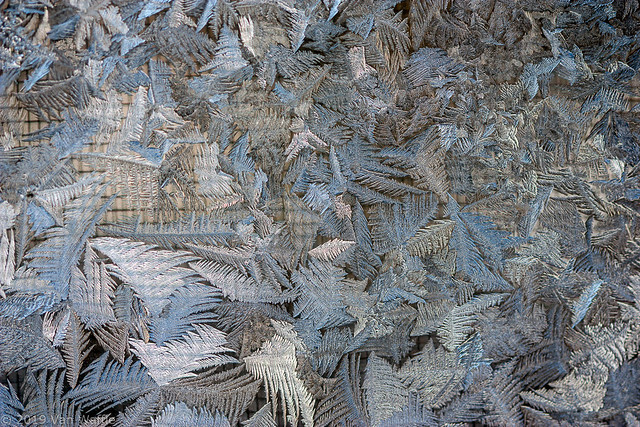 But yesterday the fern frost on the office window gave it a smattering of magic. However, my connection with the woods doesn’t allow me to stay cocooned indoors for long. I’ve built some good habits over the past year, especially walking daily. 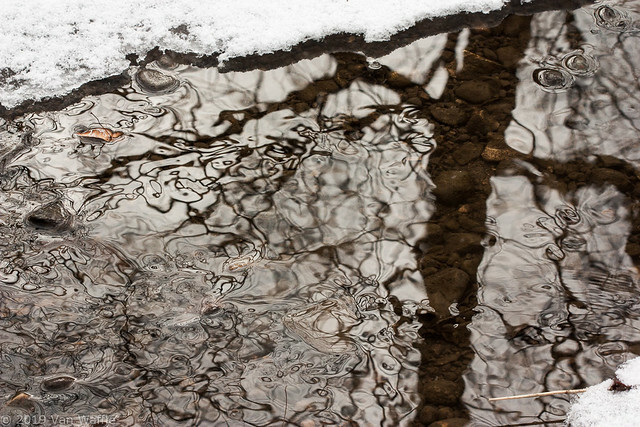 I begin to miss everything pretty quickly: the trees, the creek, the birds, even the snow and ice. Bundled warmly I hardly feel the cold. 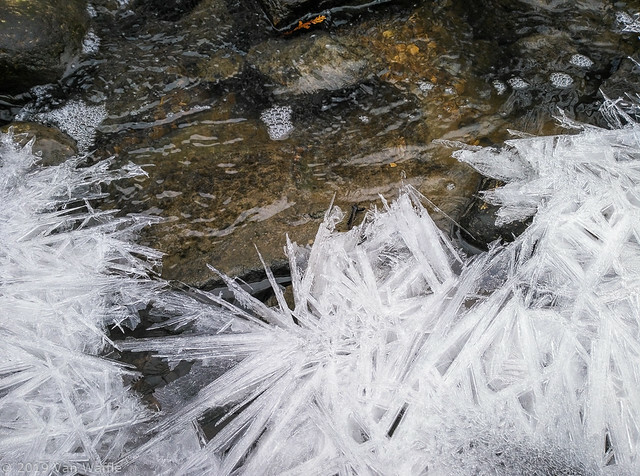 As always I’m uplifted as beauty warms icy thoughts and senses. This soup is one of my favourite work-at-home lunches but it would be easy to prepare anywhere with access to a microwave. I invented this to overcome my hankering for those quick ramen noodle packages, which are comforting but have no nutritional value that I’m aware of. It gets a couple servings of vegetables past our lips in an appetizing way. It’s quick and easy enough to assemble without thinking, in case you’re distracted. Chopping your vegetables is the only prep required besides assembly and stirring. We can get the required vegetables locally or at least Canadian-grown throughout the difficult winter months. One cabbage in the back of the fridge supplies enough leaves for several months. You can be creative and throw in whatever’s available. It’s comforting on a cold winter day, but light enough for summer, too. Sometimes when I’m lazy we have it for dinner. I usually cook it in the microwave, though it only takes a few minutes on the stove. Start with a pat of 3-minute chow mein noodles. I crunch them up in the bottom of a big soup bowl. Fresh rice noodles or any other noodle could work, but if they need to be boiled for a few minutes, prepare them first. 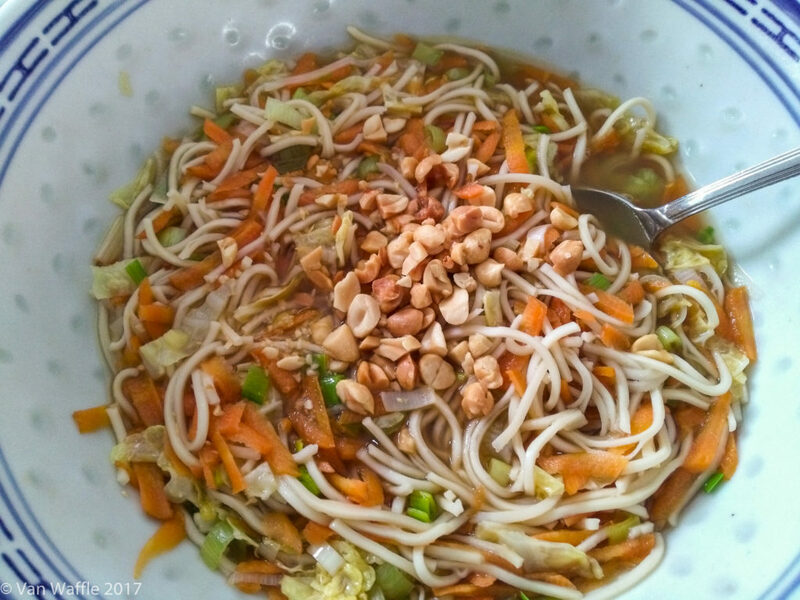 To the dry chow mein noodles, add a grated carrot, a chopped savoy or other green cabbage leaf, sprouts, and a chopped green onion or some leek. Then add flavourings of choice: maybe soy or hoisin sauce, dark sesame oil, fish sauce (omit if you don’t believe in eating animals) and a dash of tobasco. Cover with stock of your choice. Bring the whole thing to a simmer for a couple minutes, just enough to soften the noodles to your liking. Top with 2 tbsp. chopped peanuts or other protein food. Some lime juice is nice, but this is practically the only fresh ingredient I won’t have on hand without planning ahead. You could also throw on some chopped fresh cilantro, if you believe in eating cilantro. Twin Oaks Woods was a cold, hard, windy place this morning. I met several people walking their dogs. I had a particular purpose in mind and didn’t take any photos to share. I had the phone in my pocket but wasn’t carrying the camera. I’ve been making the acquaintance of several dog walkers. Women of retirement age are most likely to exchange more than a casual hello. I fear they may be from the last generation that bothers with such simple, human interaction. Today one woman suggested I should have a dog. I like dogs. I’ve considered getting one, but if I had a dog to walk I wouldn’t be able to do much photography. I told her this, and she understood. “With dogs the relationship depends on paying attention,” she said. She recalled having the same conversation with a woman photographer. Her remarks settled the question for me. I know several good photographers and artists who walk dogs. However, I go to the woods to relate with the woods. I am Twin Oaks’ pet writer and photographer. I have a soft spot for Brittany spaniels, in case you want to know. But it doesn’t matter now. I only have to imagine me down on all fours trying to photograph a wildflower or mushroom, and the dog all over me licking and trampling. 2018 was a year when I came back to nature photography with a vengeance. This wasn’t specifically a goal I had, but an outgrowth of other good habits like walking every day. As a retrospective I’d like to share my favourite photo from each of the months since the productivity started in May. 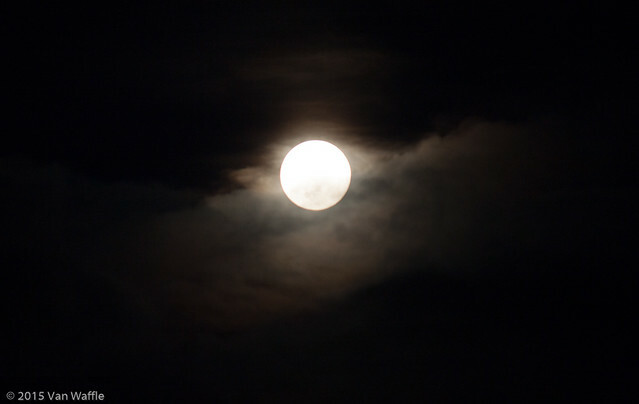 I don’t like to take my digital single-lens reflex camera every day. When I focus too much on getting the best image, I see things differently. Sometimes I miss the bigger picture. I pay less attention to sounds and other sensations. On no-camera days, I allow myself to use the camera on my phone as a way of note-taking, or to remember things I’d like to revisit with the DSLR. I take less time to compose these shots and the resolution isn’t as good, but sometimes the improv approach provides great results. Two camera phone shots appear in this collection. 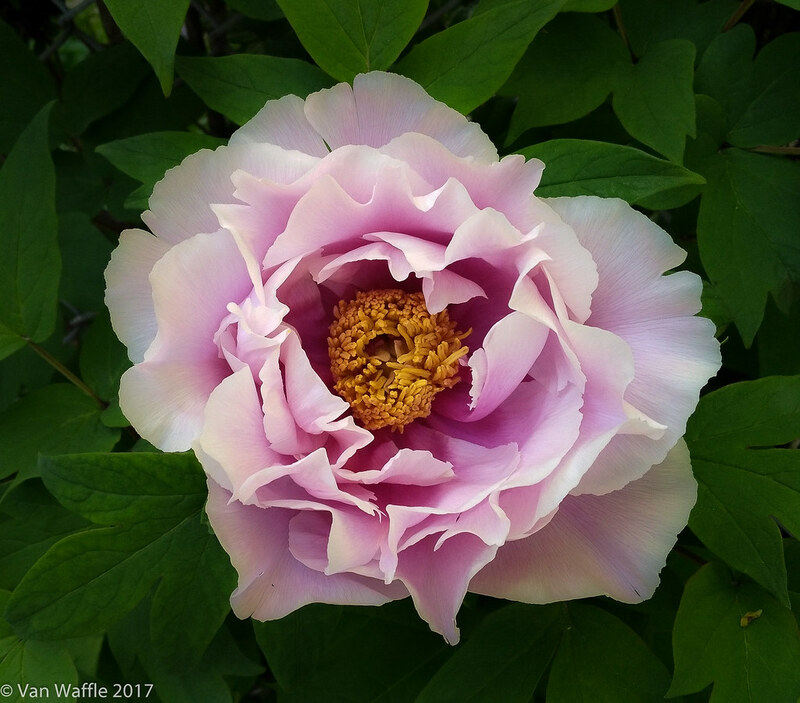 This photo of a peony blooming beside the path into Twin Oaks Woods is a stunning example. Macro photography takes us up close and personal with the wonders of nature. 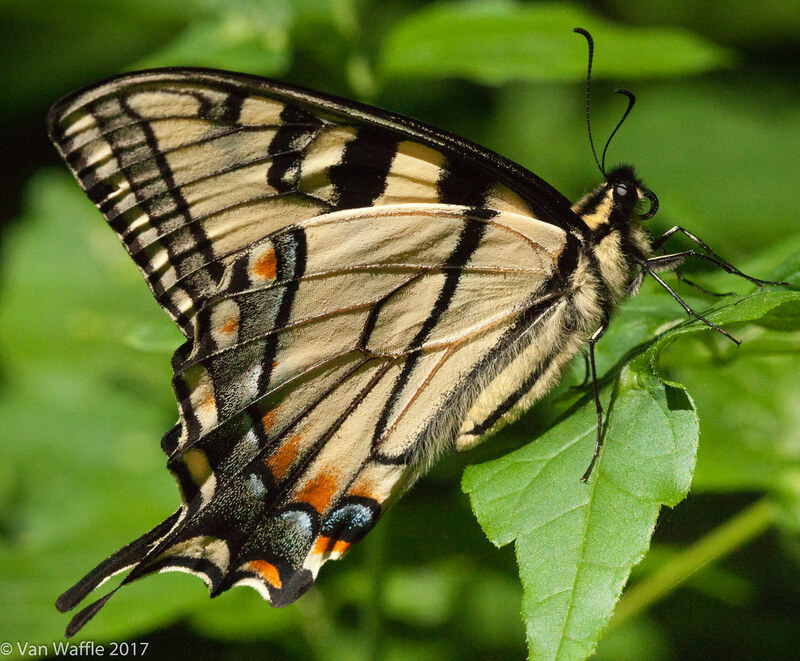 Insects, such as this Canadian tiger swallowtail, are one of my favourite things to photograph. Getting close enough and waiting for the right pose is a test of patience, but so rewarding. See my album of macro photography. The garden is an excellent supplier of beauty and imagery. We have only a small garden and several barrels outside our suburban home. Previously it was dedicated to vegetables, but given an easy supply of local summer produce, in 2018 I decided to dedicate it to herbs and flowers. My favourite rose is Abraham Darby. We planted one in memory of my mom, and it lost no time in beautifying the space. The common green darner may be one of North America’s most common dragonflies, but I don’t recall ever seeing one this close. 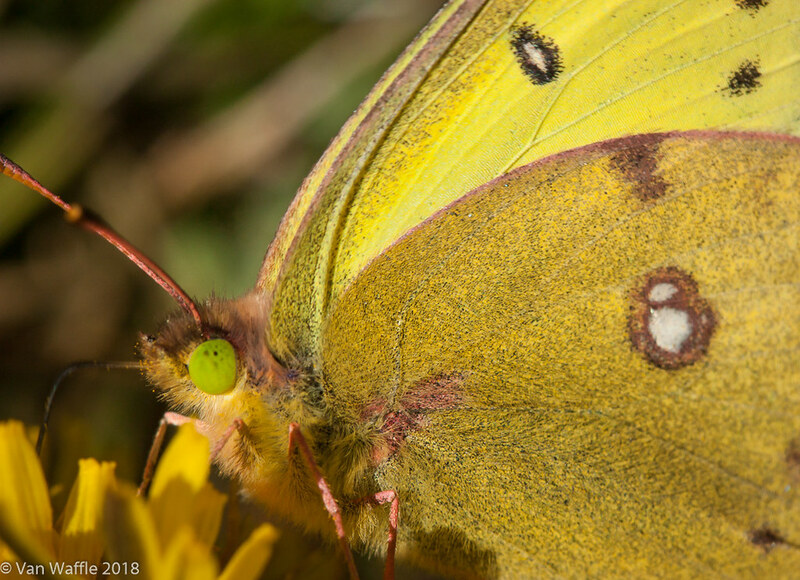 An expert told me its colouration and perfect condition indicate this adult had recently emerged and was probably still resting, explaining why it let me observe it for several minutes. 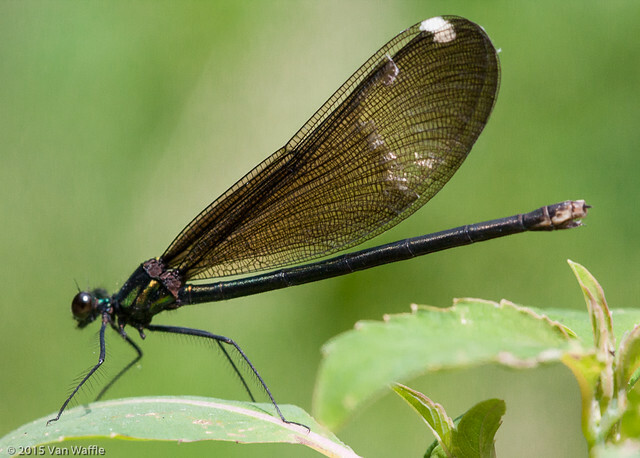 With a wingspan of 8 cm (3.1 inches) it’s one of the largest living dragonflies. 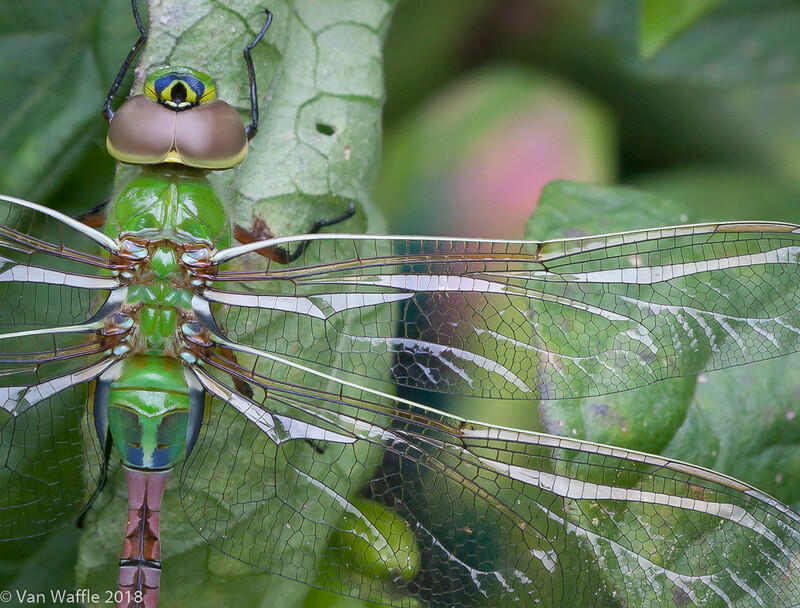 Dragonflies fascinate me with their predatory skill and intelligence. Showing so much exquisite, machine-like detail, this is one of favourite macro shots of all time. See my album of insects and a few other invertebrates. Having grown up on the shore of Lake Erie, I often miss the beach. 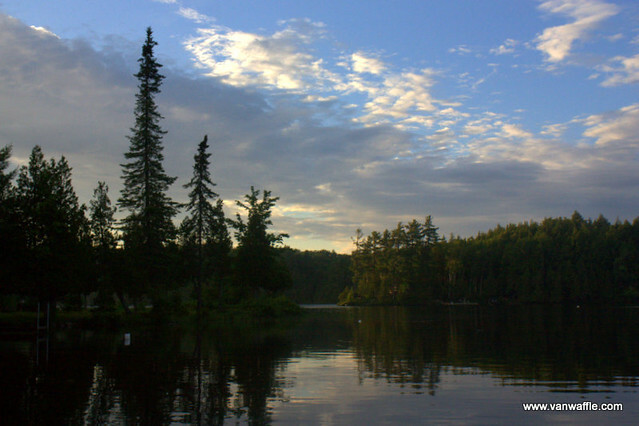 Even though we’re surrounded by Great Lakes, it isn’t easy to make time to visit them especially in summer when the cottage draws us to Central Ontario. 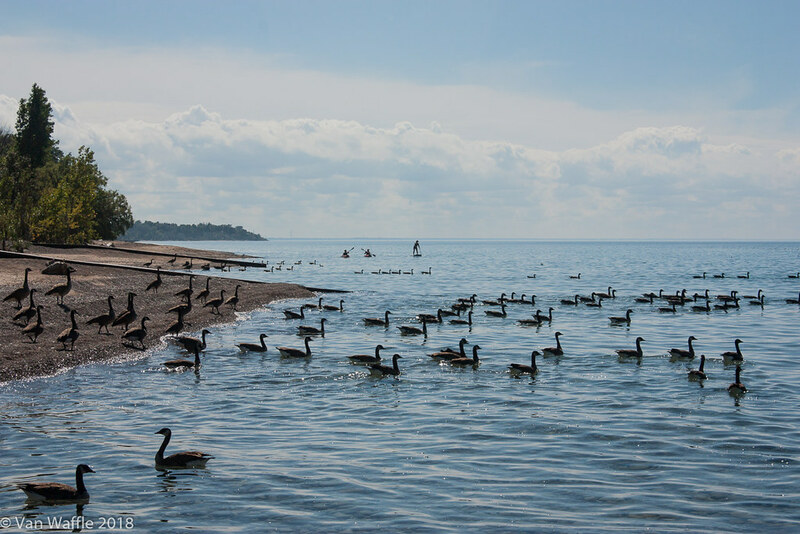 In September I needed a Great Lakes fix, so one quiet weekday my partner and I drove to Bayfield on Lake Huron. Canada geese are among my least favourite birds. When I was a child they were uncommon, but now they are so abundant and adaptable they’re becoming a nuisance, invading the habitats of less aggressive waterfowl. Nevertheless this image captures the distinct atmosphere of the Great Lakes on a splendid summer day. I also like this photo because it’s reminiscent of my favourite art movement, French Impressionism, in this case specifically the famous Neo-Impressionist painting, A Sunday Afternoon on the Island of La Grande Jatte, by George-Pierre Seurat. See my album of Great Lakes photos. Summer extended into October here in Ontario. Dandelions bloomed in the balmy weather and the playing field behind our house was a-flutter with the likes of this smoky sulphur. I lay on the ground and waited for it to crawl to the top of the flower for this portrait. It was exciting to see the details of its eye, and individual scales on its wings. November can be profoundly dreary. In the past I’ve used that as an excuse not to go outside, exercise, or bother with photography. However, this year I have been deliberately getting to know Twin Oaks Woods, a piece of surprisingly mature deciduous forest less than a one-minute stroll from my front door. The woods drops its leaves and guard in the fall, opening secret spaces to those who pay attention. 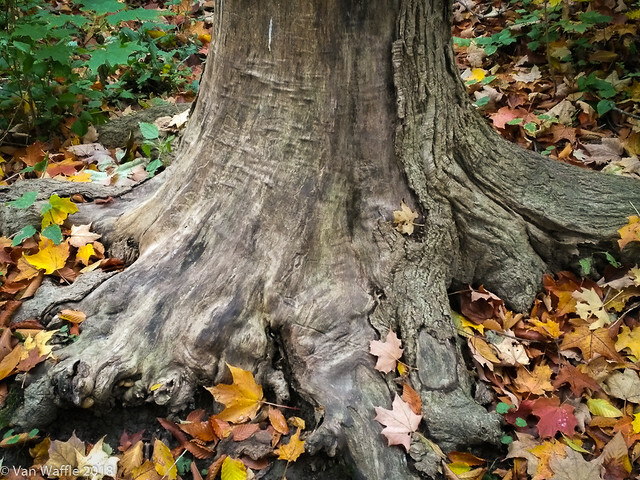 I’ve been getting to know a particular dead tree stump, which I’ve named the Ancestral Tree. Without wildflowers and much foliage around to catch my eye, I’ve discovered many magical things about this one elder being. The stump seems to be especially conducive to camera phone shots like this one. See my album devoted to the Ancestral Tree. I’ll never blow off the November woods again. December’s image is also part of the Ancestral Tree. Fungi are another one of my favourite things to photograph. Practicing several days a week has brought increasing satisfaction in working with a macro lens. 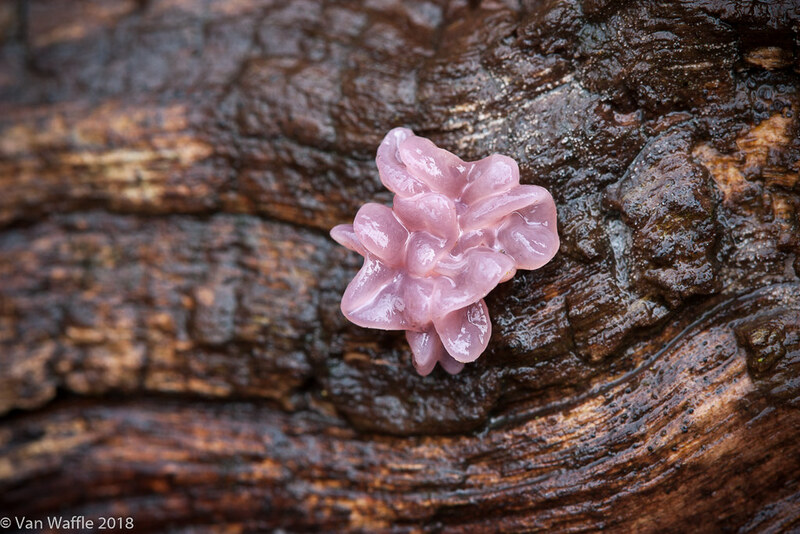 This purple jelly drop fungus is smaller than my baby fingernail. This charming woodland sprite appeared during a thaw on the shortest day of the year. 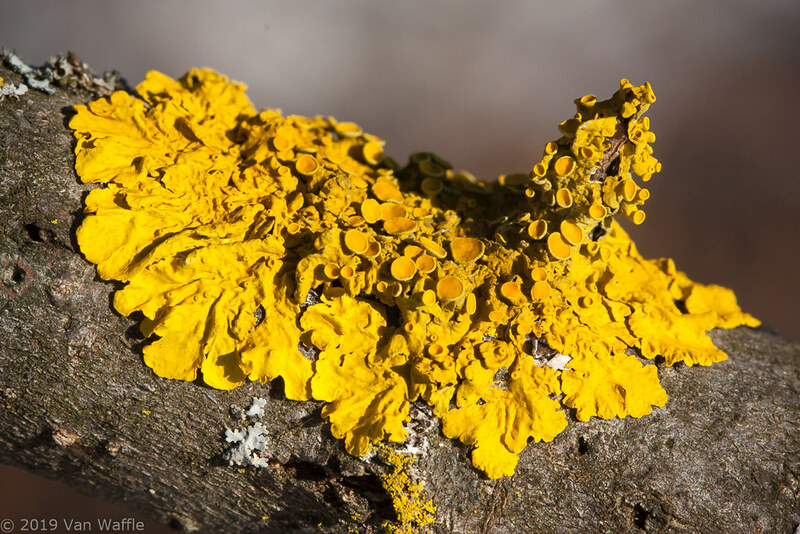 See my album devoted to fungi and lichen. I hope you’ve enjoyed this retrospective of images from 2018. Here’s to peace, beauty and light in 2019. Every year is important, but 2019 feels like one of the most important in my adult life. I’ve moved forward in many ways, some personal, but also as a writer, photographer and naturalist. One impetus came from a book that will change how I relate to nature forever. An artist needs an experience as rich and deep as prairie soil to grow their creative work. Self-help authors like Natalie Goldberg (Writing Down the Bones) and Julia Cameron (The Artist’s Way) have exhorted a generation of wordsmiths in the importance of knowing our own minds. Anyone who liked these and wants to cultivate an authentic sense of place in their writing must visit The Soul of Place (Travelers’ Tales, 2015) by Linda Lappin. Then set aside a few weeks to study its lessons. One of the most venerable books in this genre may be The Sierra Club Nature Writing Handbook, by John A. Murray. I’ve owned a copy for many years. It’s written in formal text book style. The exercises are academic and intimidating. Unfortunately I never persevere well enough by gritting my teeth on long, solitary marches. Nearly four years ago, I found myself living in a suburb of an unfamiliar city. From my second-story office window I see trees beckoning me to Twin Oaks Woods, especially one black cherry arching over the maples and black walnuts. Connection to the land is something I’ve always valued. Every move uproots me uncomfortably. I lose the love of a familiar environment. Believing this home would be a temporary one, I visited but kept aloof from the local crows, the ephemeral trilliums and spring-beauties, the muskrat in Cedar Creek, and especially the wise trees. But disconnection can cause depression. Two years ago I needed to settle into this house, this office, and especially this land. 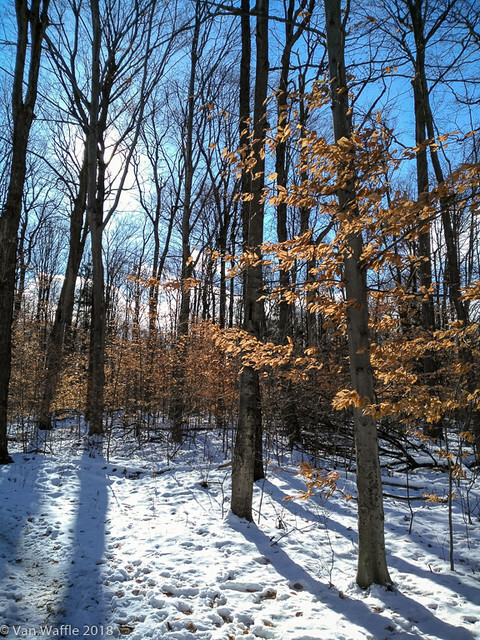 Twin Oaks Woods is rich and kind, a remarkable neighbour for any nature lover. I started to seek a belonging, spirituality and inspiration that were shaken out of me many years ago. I experimented with walking as exercise, walking with a camera, walking with a notebook, walking in meditation. It strikes me now how hard it seemed at first. I had picked up The Soul of Place more than a year ago. Knowing instinctively it would be useful, I saved the reading for a week alone at the cottage last June. Lake Fletcher has been one constant throughout my life: a sanctuary and increasingly a friend. In the ensuing days I continued, digging deeper into this place I had always known, sinking into the comfort of a book that seemed to know me personally. The exercises focus on tools like imagery, walking and writing, and water. Chapter 1 also explores the 18th Century Romantic writers’ concept of beauty and the sublime in landscape. But Lappin goes way beyond nature writing. Chapter 2 addresses sacred and urban places such as markets. She explores the 19th Century French tradition of flâneurs, wanderers who commented on modern life. Chapter 3 investigates rooms and their contents. Chapter 4 provides a delicious study of food writing. Finally, one of my favourite chapters mines the unconscious using exercises about dream work, symbolism, mythic elements, labyrinths, et cetera. Returning home from the cottage retreat, I decided to follow another suggestion from The Soul of Place by spending seven weeks keeping a nature journal on weekly topics, one hour a day. I chose the themes: water, rooms, forests, blue, fruit, night, & beauty. I invited a few writer friends to join me in this summer writing challenge, which helped focus my intention through accountability. At the end I had written every day averaging more than 750 words for a total of 39,000 words. One of my favourite pieces was a poem about apricots. Towards the end of this project, some difficult ideas and memories emerged. Self-therapy crept into the writing. Who knew fruit could be traumatic? The process taught some valuable lessons about when the self needs attention, when to let go and move on. The Soul of Place stands out by being well researched, focused, down to Earth, thoughtful and authentic. Other books have helped me explore and gain confidence in myself as a writer, but this one developed my work in a genre that feels most meaningful. No forced march here, the exercises invite personal expression and curiosity to learn more. It was often fun, often surprising. It changed how I write. More intensive projects at the end of each chapter will inspire work for publication. The book’s title is a translation of genius loci, a term from classical Roman religion for the guardian spirit of a house. The concept has been used in landscape architecture to describe how human intervention should respect natural ambiance. These readings and exercises helped me connect more deeply with the spirit of Lake Fletcher I’ve known all my life. However, back home I’ve finally met the genius loci of Twin Oaks Woods, every bit as vital. It feeds images and ideas into a daily creative process. Now I can hardly wait to go for a walk each morning. When the first camera phones appeared, I thought, “What a stupid idea!” I was wrong. These days I walk in the woods primarily to connect with nature. A camera can get in the way – as I’ve written recently. I’m particularly drawn to macro photography, so it’s easy to let things on the ground distract me from the bigger picture. I’ve begun leaving the DSLR camera at home most days. This feels like a sacrifice. It’s like the 20 minutes we might give up from whatever else we do in order to meditate. At first we encounter frustration, boredom, all the feelings that usually get ignored. But in facing them, we discover a richer world within. Without the camera I pay more attention to the way the air feels, the sounds of rain or leaves falling or wind in the branches, the movement of the forest canopy. I pay more attention to clouds and light, rather than just worrying whether I have enough light for a photo, or whether it’s going to rain hard enough that I should return home. I prefer not to get the camera wet, but otherwise I’ll continue walking in the rain if dressed appropriately. However, I still use a camera phone whenever I want. These photos usually only record things I see and want to remember to write about later. They are spontaneous and quick, hardly disturbing the pace of exercise, hardly disturbing my experience with the forest. Light from the sky washes out the screen of the phone so I can hardly see the image. Composition doesn’t take much time or attention. 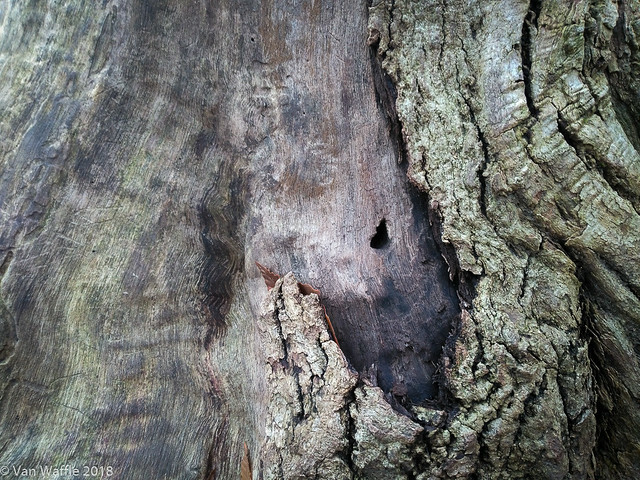 If I find something particularly compelling, I can always return with the DSLR camera later. With the phone quickly deposited back in its pocket, I continue my stroll. So this series of four photos is particularly magical. They were taken on the camera phone within a 15 minute period this morning. They were selected from 15 photos taken during that period. I also stopped to commune with a beech tree, study its bark, and look up at the canopy. Digital technology makes it possible to take thousands of images at no cost and discard the vast majority. It still requires skill and creativity to produce a work of art. However, it’s a much different craft from when we shot a roll of film then toiled in the dark room to overcome our mistakes. But photography also involves some luck of the draw. This morning with the phone I could not give thought to depth of field, the right light, sharpness. I just saw things I liked, spent a moment composing them, then shot. My phone offers the ability to manipulate f-stop, shutter speed, and other ways of finessing an image, but I rarely use them. Today I drew four aces. Ok, face cards at least. They don’t appear here strictly as shot. Phone photography benefits from some simple adjustments in Lightroom, as does DSLR photography: cropping, adjustments to exposure and clarity, spot removal. The images lack high enough resolution for an art print, but they’re wonderfully presentable online, so what’s the difference? That’s another discussion entirely. 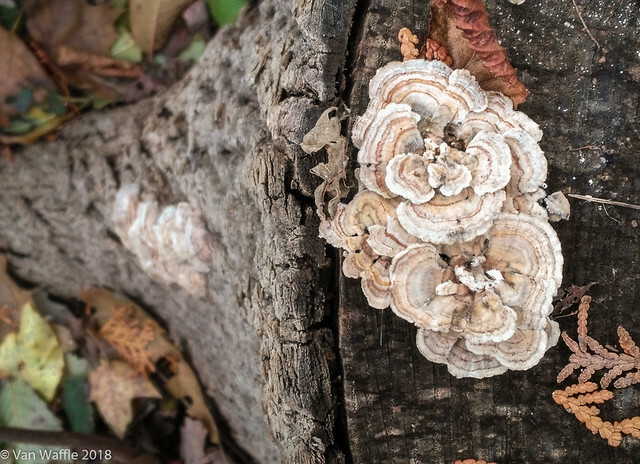 I love the complex, subtle palette of autumn colours, crisp textures begging for a touch, the playfulness of light across surfaces, the right depth of field in the image of turkey tail fungus above. These shots prove we have a universe of beauty right outside our doors if only we look for it. Camera phones have democratized photography. This presents some problems, like the sheer volume of bad images, and the invasion of privacy by billions of people who haven’t learned to weigh the consequences. I’ll admit to a prejudice against heavily manipulated images. Hopefully the opportunity in time will bring not only more artistic license but also literacy. I get my phone free every two or three years with a service contract. 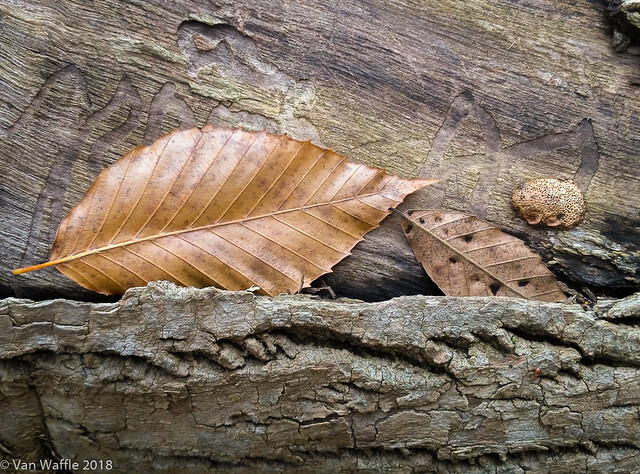 These images show practically everyone has a tool to capture remarkable photos. In fact, a phone is a great camera to start with for anyone who wants to get into photography more seriously. Constraints are good. They are a powerful stimulus to creativity. Limitations can also teach us patience. And patience and practice are prerequisites for excellence.